There are many drugs that come to market every year and as a horse owner their arrival can provide a barrage of overwhelming complex medical data that encourages us to simply defer our decision on their use to our trusted vet. One of the most common bony changes that occur in our horses is that of their navicular bone. 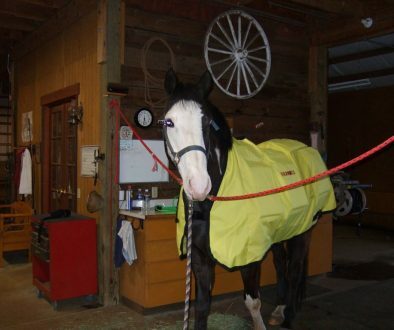 It is no wonder that when Osphos® arrived on the market, horse owners welcomed it with open arms. This drug is a biophosphonate drug manufactured by Dechra Veterinary Products, and was approved in 2014 by the F.D.A. for use in treatment of navicular syndrome or chronic changes in non-breeding horses over the age of four years. Suggested administration is via intramuscular injection. During clinical trials that were performed by Dechra, the drug helped horses improve 1 grade of lameness in 75% of cases. Osphos®, works by inhibiting bone resorption, binding calcium phosphate crystals, thus reducing bone pain. Clinical improvement was typically most evident at 2 months after this first injection and 65% maintained their level of improvement for 6 months. Further injections can be administered as needed to help maintain improvement. Interestingly, a more potent version of this drug began life as F.D.A. approved Fosamex® in 1995 and was used in humans to stabilize bone density, especially to treat osteoporosis in menopausal women. Studies in 2010 drew attention to the increase in atypical fractures (particularly in the femur) associated with Fosamex® use, and its manufacturer, Merck & Co., received over 5000 lawsuits concerning the dangers of its use. It is believed by equine industry experts such as Dr. Mary Scollay, Equine Medical Director for the Kentucky Racing Commission, that Osphos® is not understood to have the same side effects. Osteoclasts are cells responsible for both building bone and destroying bone. Bisphosphonates are poisonous to osteoclasts, the builders of bone density. As bone density and bone remodeling are part of the reaction that occurs during training, there is an obvious concern that when used in young horses the bone regeneration process could be interrupted and result in brittle bones and a higher risk of fractures. It should be pointed out that whichever drug, Osphos® or Fosamex®, their use does increase gastrointestinal and kidney problems. In horses, colic episodes following administration of Osphos® have clearly been reported as an adverse effect. There are many observations of this side effect posted on equine forums. As is often the case in drug approvals, the original F.D.A. approved use of Osphos® has transcended its original clinically approved administration, and vets have taken to using it for all sorts of treatments from sore hocks, backs and fetlocks, to sesmoiditis and puffy ankles. As the drug clears the blood within 90-120 minutes of administration, a horse buyer would have no indication of whether the horse has been subjected to Osphos® even though the drug is believed to live on the bone surface for years preventing bone remodeling or regeneration. For example, you could take X-rays of a warmblood at auction before purchasing and believe he had clean bones with no evidence bone remodeling, when in fact he could have received Osphos® previously and be at risk for fractures. As a Grand Prix dressage rider I have imported many horses from Germany over the years in my career. At one point so many of the 120+ horses presented at any given Elite auction, showed X-ray bone issues it was considered the norm. In fact, when I was a frequent horse buyer in Verden back in the mid to late 1990’s, the official auction vet Dr. Gerd Bruncken, told me over 65% of the horses presented to them for the auction showed evidence of OCD and inflammation issues on radiographs. A few years later, when arthroscopic surgery became readily available and affordable, two year old horses were routinely ‘cleaned’ before auction so that signs of OCD ‘chips’ or other issues were removed. At that point my knowledgeable friend and UK vet, who was actually German by birthright, advised me to look for X-rays that were ‘too clean’ and avoid those horses. In the world of horse buying, whether it be an OTTB or a top performance racehorse or sporthorse, it is imperative that the history of the horse be clear. If a horse has been administered Osphos®, which presently cannot be tested for without invasive bone sampling, a buyer would have no idea of the future soundness of the horse and whether a seller was ‘hiding’ a lameness issue that might blow up into a fracture down the road. As a horse owner it pays to do your due diligence regarding any drug administered to your horse. An intelligent decision protects your horse’s wellbeing so before you administer Osphos® to your horse it is only logical to look at other alternatives that may to be much safer. Let’s take a look at them. Microcurrent Therapy ~ There’s nothing micro about this therapy and it is not a TENS treatment. Microcurrent is a very low-level of electrical current that operates in the microamperes (amperes scale), and microcurrent therapy is the surface application of this current. Microcurrent units produce electrical current just above the levels of the electrical exchanges that occur at a cellular level in the human body. Microcurrent therapy should not be confused with other devices in the transcutaneous electrical nerve stimulator (TENS) family, which operate at much higher electrical current (milliampheres) and are used primarily for pain control. Our bodies and those of our horses are electrically charged throughout. When our cells are damaged through injury or inflammation they become electrically imbalanced. When you apply microcurrent therapy the electrical current will also mimic the body’s own electrical current. Applying microcurrent directly over the damaged cells will actually help re-balance those cells effectively healing the tissue. To actually heal damage and inflammatory responses and to provide an adjunct to help the body’s own resources operate to facilitate healing without any short or long term negative effects is a natural method to aid recovery from a myriad of lameness issues as well as acute injuries in the horse. There is no masking of a problem or negative side-effect of microcurrent therapy. MCT is highly regarded as an effective alternative to surgery and other treatments of both acute and chronic issues in the body. Microcurrent therapy with biofeedback offers a non-invasive, diagnostic and trackable method that can be used quickly and effectively without fuss, and can be used in conjunction with your vet and/or without the cost of a vet in direct attendance. Iontophoresis ~ Sounds complicated but isn’t. Basically Iontophoresis a proven method to administer medication to a specific site on your horse using microcurrent as a method of transferring medications through the skin using electrical current. Special patches that hold the medication prescribed by your veterinarian are activated through small amounts of electrical current and this provides a no needle, non-invasive method of delivery directly to the site where it is required. This method has been shown to treat rough edges on calcified joints such as ringbone, can actually help heal suspensory ligament injuries, sore shins and puffy ankles. A great additional benefit of the use of Iontophoresis, and microcurrent (or low milliamperage) therapy, in general is the pain relief it also provides as it reduces inflammation and soreness. Many horse owners have realized the benefits of using iontophoresis to heal injuries as the first course of action, without running through the more common shockwave and stem cell therapies. Certainly as a horse owner, any time you can avoid sticking needles in your horse you know you are eliminating the chance of infection and soreness at the injection site(s). So in conclusion please do your due diligence when making health choices on behalf of your horse. The time you spend now will likely sincerely affect the long-term health and life of your equine partner. After all, he cannot read or make his own health care decisions. It is up to you, you are his proxy! About the author: Nikki Alvin-Smith is a professional freelance writer. She is an international Grand Prix dressage trainer/clinician who has competed in Europe at the Grand Prix level. Together with her husband Paul, who is also a Grand Prix rider, they operate Willowview Hill Farm, a private horse breeding/training farm in Stamford, NY. Please visit her website at https:/www.NikkiAlvinSmithStudio.com to learn more.